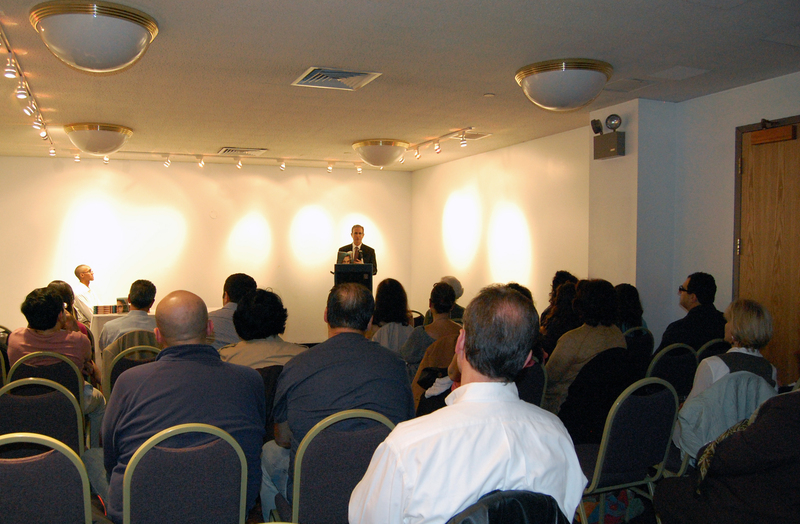 Mark Mustian, author of the critically acclaimed novel, “The Gendarme,” presented his book on Wednesday evening, October 12, at the Diocesan Center in Manhattan. The event, hosted by the Armenian Network of America (Greater New York Region), Armenian Students Association and the Zohrab Center, started with an introduction by Talene Kachadourian, President of the Armenian Network of America. She spoke of Mustian’s background as a lawyer and as City Commissioner in Tallahassee, Fla., where he currently lives with his wife and three children. Published last year, “The Gendarme” quickly created a buzz and was the winner of the 2010 Florida Gold Book Award for General Fiction. It is a finalist for the 2011 Dayton International Literary Peace Prize. The book has been translated into eight foreign editions in Brazil, Bulgaria, France, Greece, Israel, and Spain, among others. Mustian’s novel follows the story of a Turkish gendarme officer who once lead the Armenians on the death marches of 1915. Following an injury at Gallipoli, he was sent to an Allied Hospital where he met and married an American nurse, and eventually settled in the United States–having lost all recollection of the Armenian Genocide. Almost a century later, the officer, now 92, suffers a brain tumor and begins to recall the story of his youth, and to seek redemption before it is too late. Following Kachadourian’s introduction, Mustian discussed his book, which touches on many themes within the larger context of the Armenian Genocide, including the role of memory, politics, religion, and human relationships. guests had the opportunity to speak with Mustian further. For more information about “The Gendarme” and its author, please visit www.markmustian.com. This was a great event. I enjoyed meeting Mr. Mustian and learning about his latest book. Thank you for hosting such a wonderful evening!